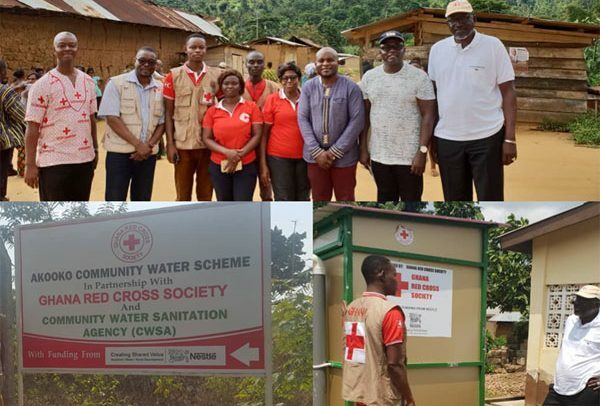 Nestlé Ghana has provided the Akooko and Esikasu communities with water and sanitary facilities through its partnership with the International Federation of Red Cross and Red Crescent Societies (IFRC). Residents of Akooko now have a borehole producing about 192,000 litres of water per day distributed through eight standing pipes in vantage locations of the community. In Esikasu, two boreholes have been drilled while broken water points have been refurbished to serve the community sufficient water daily in addition to a “bio-digester” toilet facility. Secretary General of IFRC, El Hadj As Sy, who visited Ghana for an advocacy conference on Global Road Safety, conducted a field visit with some officials of Nestlé and IFRC Ghana to Akooko and Esikasu to evaluate the Ghana WASH project and interact with beneficiaries to reflect on its impact. Samuel Komlorm, Assemblyman of Esikasu, thanked Nestlé and IFRC for their contributions in creating awareness about health and providing the communities with water and sanitary facilities. He also commended the project partners for expanding WASH to cover the needs of people with disabilities. “One area often ignored in the provision of water and sanitation services is needs of people with disabilities. We are happy that the Nestlé-IFRC WASH project is consulting and involving people with disabilities in the planning and implementation of activities,” he said. El Hadj As Sy commended the good work of the Ghana Red Cross team and volunteers for delivering WASH services to communities and facilitating positive change in the lives of vulnerable people. He thanked Nestlé for a great partnership and financial support that is offering to addressing WASH challenges, including prevention of diseases such as cholera and diarrhoea in deprived communities. Philomena Tan, Managing Director of Nestlé Ghana said, “Nestlé believes that industry has an active role to play if the Sustainable Development Goals should be a realization. As a nutrition health and wellness company, we commit to strategic partnerships to help make sustainable impact in communities directly connected to our business. This is one way we demonstrate our commitment to Rural Development under our Creating Shared Value concept to help improve 30 million livelihoods directly connected to our business by 2030.